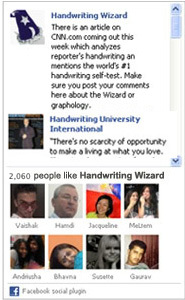 You've Discovered the World's Most Popular Free Online Handwriting Analysis Website. Are You Ready To See What Your Handwriting Reveals? You can use this on-line software to quickly analyze your own or a friend's handwriting. Based on your input, the computer will generate an accurate and in-depth written report about the personality of the writer. We use our eyes and our brains to generate an amazingly insightful 5 page written personality profile. And, it's free. "The test was well-crafted and my results were accurate! Bravo!" seriously checking into this. Thank you for a truly wonderful experience. " "The analysis was quite accurate, and I'm really interested in learning more about handwriting analysis. Thank you so very much." Answer a few questions about your handwriting sample. Read the 5 page report about the person's true personality.